Own Gremlins - Film Gizmo Mug from Deff, DVD, Blu-Ray & 4K Video Specialists - Free UK Delivery..
Own Gremlins - Gizmo Mug from Deff, DVD, Blu-Ray & 4K Video Specialists - Free UK Delivery..
Own Gremlins - Kingston Falls Mug from Deff, DVD, Blu-Ray & 4K Video Specialists - Free UK Delivery..
Own Gremlins - Mogwai Rules Mug from Deff, DVD, Blu-Ray & 4K Video Specialists - Free UK Delivery..
Own Gremlins - Polaroid Gizmo Mug from Deff, DVD, Blu-Ray & 4K Video Specialists - Free UK Delivery..
Own Gremlins - Three Rules Mug from Deff, DVD, Blu-Ray & 4K Video Specialists - Free UK Delivery..
Own Gremlins - Yum Yum Mug from Deff, DVD, Blu-Ray & 4K Video Specialists - Free UK Delivery..
Gremlins: From producer Steven Spielberg and director Joe Dante, a grim fairytale introducing a new creature unlike any ever seen before - the funny, clever, cute and extremely dangerous Gremlin. Warning: Don't ever get them wet. Keep them out of bright light...it will kill them. But the most important thing, the one you must never forget, no matter how much they beg, never feed them after midnight. Gremlins 2 - The New Batch: The rul..
Gremlins: From producer Steven Spielberg and director Joe Dante, a grim fairytale introducing a new creature unlike any ever seen before - the funny, clever, cute and extremely dangerous Gremlin. Warning: Don't ever get them wet. Keep them out of bright light...it will kill them. But the most important thing, the one you must never forget, no matter how much they beg, never feed them after midnight. Gremlins 2 - The New Batch: The rules..
More fun than a barrel of Gremlins with new special features! Special Features Cute, Clever, Mischievous, Intelligent And Dangerous: Making Gremlins - Don't Get Him Wet, Keep Him Out Of Bright Light, And Never Feed Him After Midnight! 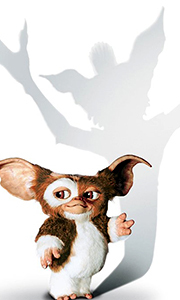 Discover The Incredible Story Behind Gizmo's Amazing Journey From An Antique Store In Chinatown To The Big Screen, From Gizmo To Gremlins: Creating The Creatures - Discover The Incredible Artistry Involve..
Don't ever get it wet. Keep it away from bright light. And no matter how much it cries, no matter how much it begs...never, ever feed it after midnight. With these instructions, young Billy Peltzer takes possession of his cuddly new pet. Billy will get a whole lot more than he bargained for. "Gremlins" is hilariously funny and wickedly scary. One minute you'll hide your eyes in fright, the next you'll hold your sides with laughter. If y..
Own Gremlins - We're Here Mug from Deff, DVD, Blu-Ray & 4K Video Specialists - Free UK Delivery..
Gremlins is a wildly original roller-coaster ride of hilarious mischief. One minute your hair will stand on end, the next you’ll hold your sides with laughter at the havoc these supposedly gentle furballs create when the rules surrounding their care and feeding are inadvertently broken one fateful Christmas. Written by Chris Columbus and directed by Joe Dante, Gremlins unleashes special effects that dazzle and enchant and merriment that..